Good conversation is at the heart of networking, meetings, interviews, negotiations and raising your profile. It can ease your way in work, enabling you to build alliances, create strong relationships with staff, bosses and clients, succeed at interviews, motivate and inspire. But conversation is something most of us were never taught! We learn to speak as babies, but how conversation actually works is something most of us pick up only haphazardly, and many have yet to learn. Why is it some of us are stuck for words, but others blabber or can’t stop? What is it that some people have naturally which enables them to converse comfortably and easily, to engage people and build better relationships? -Use conversation to form relationships, improve friendships, make the sale, chat people up, to learn, influence and persuade. Judy Apps is a qualified NLP trainer and professional certified coach with the International Coaching Federation. (ICF), coaching an average of 70 corporate clients a year, ranging from Sussex Police to EA Games. 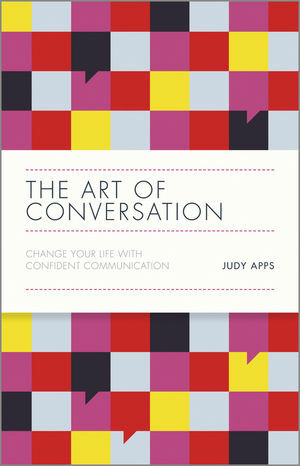 Judy has spent many years unravelling the secrets of how great leaders communicate and inspire, and now coaches people from all walks of life- from leaders of major international corporations to politicians, media people, coaches and all who want to communicate with more influence. Judy is the author of three books: Voice of Influence- How To Get People to love to listen to you; Butterflies and Sweaty Palms- 25 Sure-Fire Way to Speak and Present with Confidence, and Voice and Speaking Skills for Dummies.